Significant Work: Won five consecutive gold Olympic medals from 1984 to 2000, three gold medals at the Commonwealth Games and nine gold medals at the World Rowing Championships. 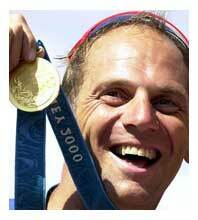 Steve Redgrave found school hard due to his Dyslexia however, he excelled at sport and competed at a reasonably high level at an early age. How his Diabetes didn’t stop in and in 2000 Steve went on to win his fifth consecutive gold medal at the Sidney Olympics.Now Steve is a very popular after dinner and motivational speaker, he has created his own charity the Steve Redgrave Fund and is a patron of CEDAR (Centre for Endocrinology Diabetes and Research) and CRY (Cardiac Risk in the Young).